New Year, who this? The new year is the perfect time and opportunity to throw away all the old baggage and welcome in the new. Whether you’ve had a crummy year or a great one, it’s time to start afresh and embark new adventures and create new memories. You have an astounding year ahead! The ADA recommends brushing your teeth twice a day for 2 minutes at a time. This is the optimal duration to effectively remove plaque that has adhered on to the surfaces of your teeth throughout the day. Did you know electric toothbrushes are programmed to operate for two minutes at a time? They make brushing almost effortless! Floss isn’t just for removing food debris stuck between the teeth but also for disturbing biofilm that adheres to the surfaces as well. Flossing is the best way to attack plaque between the teeth at the gum line. It is recommended that you floss at least once daily, but hey shoot for after meals if you’re already doing that much! We’re not stopping you. 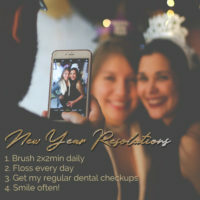 You could be doing all of the above but without your professional dental cleanings, you will still be lacking. At your regular dental checkups, Dr. Co will examine the mouth to make sure everything is still in good shape and our hygienist, Becca, will remove any calcified tartar that has inhabited the surfaces of your teeth. Professional dental cleaning is the only way to remove calculus. Leave it to the pros to make your smile game strong! Smiling is contagious! Whether it’s a genuine smile or you have to fake it ’til you make it, smiling is healthy for you. It’s your body’s natural way of harboring a positive mind and attitude. Plus, you never know who love to see you smile! What are your resolutions for yourself in 2018? Let us know in the comments below or tell us at your next appointment! Call us at 206.440.0065 to schedule your next dental cleaning for the new year!